This three-wheeled pioneer is designed, developed and tested to the highest standards of the Motor Company and backed by over a hundred years of touring mastery. This is not a bolt-on, aftermarket Trike kit. It’s engineered and road-tested as a whole. Every inch is integrated for comfort, cargo and confidence. From the smooth, classically designed lines to the front-to-rear matching paint, the Tri Glide™ Ultra Classic® model has the bloodlines of a true Harley-Davidson® motorcycle through and through. No Harley-Davidson® motorcycle is complete without a killer set of wheels. Here, the split seven-spoke cast aluminum wheels give the Tri Glide™ Ultra Classic® model an integrated factory-built look, adding emphasis to the deliberate detail and engineering of this three-wheeled touring masterpiece. Put the ‘haul’ in long haul with a cargo capacity of 6.7 cubic feet and up to 80 pounds. On top of the extra stowaway space, the waterproof, injection-molded Tour Pak® keeps things classy and neat with woven-nylon soft luggage liners, plenty of storage pockets and distinctive, wrap-around rear lights. 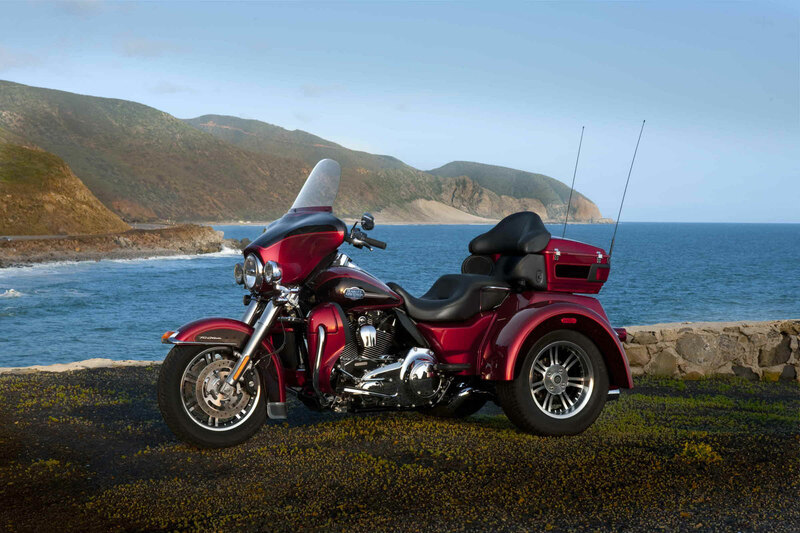 But anyone who’s taken their Harley-Davidson® Trike for a cross-country trek or a trip to Biketoberfest knows it’s the trunk that turns luxury touring into luxury living on the road. Feast your eyes on the Twin Cam 103™ engine and there’s no mistaking its roots. This is authentic Harley-Davidson style through and through with an attention to detail you won’t find from any other motorcycle company. Black powder-coated cylinders and cylinder heads with machined cooling fin tips are topped off with chrome rocker covers, while chrome pushrods highlight the iconic V-Twin. It’s a jewel machined out of metal. Pure. Dripping with power. From the classic edge of the cooling fins to the clean lines of cases and covers—the Twin Cam 103™ engine makes an ironclad statement to holding on to what’s right and staying true to what satisfies the rider. A new level of control for our stock Trike lineup. Electric reverse with LED indicator is now standard. 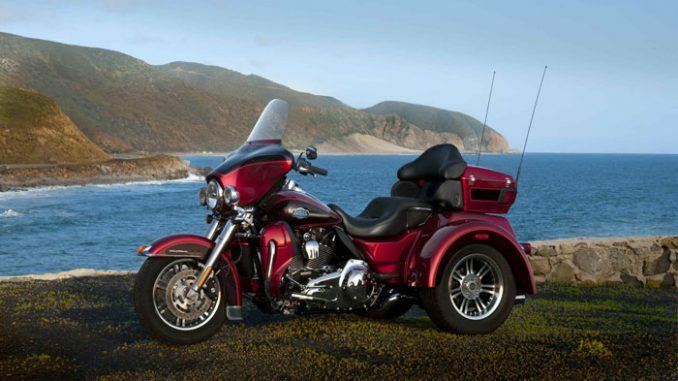 It’s one of those things we do because we know what you expect from the ultimate Harley-Davidson® touring machine. And we know the kind of performance you expect at your fingertips. Harley-Davidson® touring means maximum comfort in all conditions and the capacity to add whatever enhances and personalizes your ride. The high output charging system provides an electrical capacity robust enough for your add-ons: heated vests, heated seats, heated handgrips, lights to showcase the engine, you name it. So if you’re hell-bent on three-wheeling it, we make sure you’ve got the juice to do it your way. The factory installed next-generation security system features a hands-free fob that automatically arms and disarms the vehicle electronic security functions as you approach and walk away from the bike. Stick the fob on your ignition key ring and let it do all the work. It’s this attention to details and security that make Harley-Davidson® motorcycle unique. 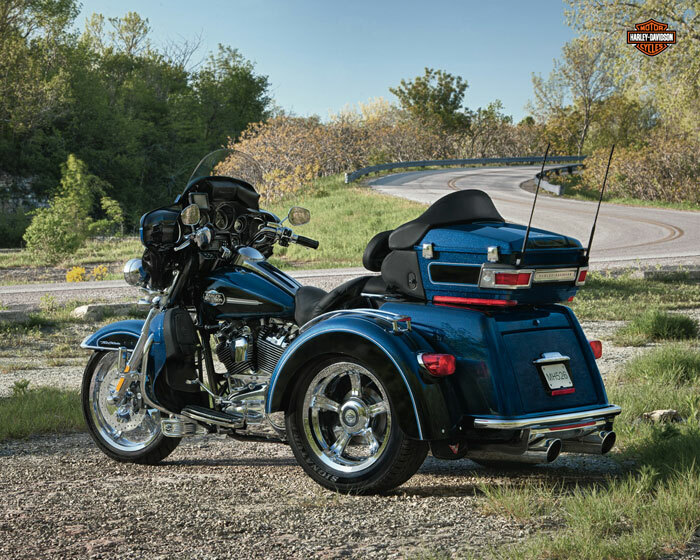 A long, raked out fork makes sure the Tri Glide™ Ultra Classic® model rides as smooth as it looks, offering reduced effort for steering. Plus a steering damper controls feedback from the road. So when you’re out with your bagger buddies, you’ll stay right at the front of the pack. The two-up seat combines a streamlined look with comfort and convenience for either long weekend hauls or journeys beyond the state line. Premium seat material stitched together with great attention to detail and ergonomically engineered to keep your bottom side comfortable with high-tech foam filler, you can go solo for miles or bring along a passenger to share the experience. The seat features a passenger backrest that is integrated into the Tour-Pak® lid with wrap-around armrests for added comfort for every adventure. Classic style and maximum comfort. 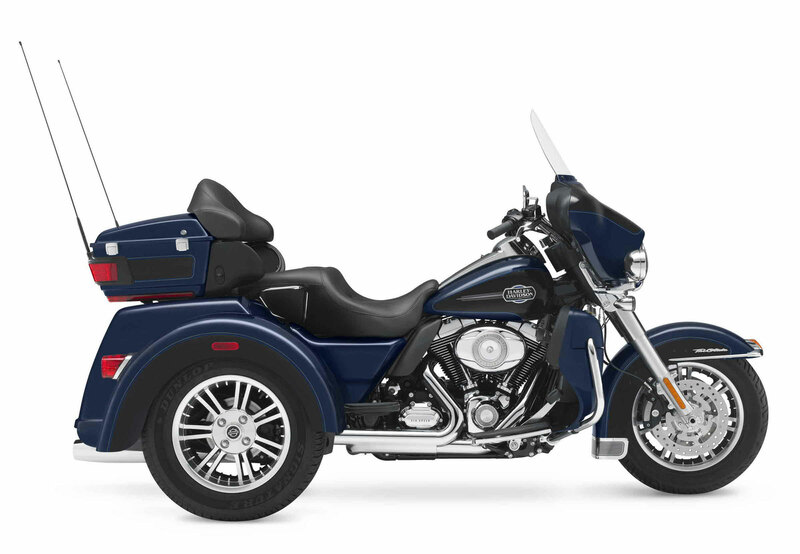 That’s the perfect balance of the wide set handlebars that come standard on the Tri Glide™ Ultra Classic® model. They’re designed to keep you comfortably propped in a commanding position while making sure your neck muscles stay calm and relaxed mile after mile, state after state. Durable stainless steel insures the structural rigidity you expect from a Harley-Davidson® motorcycle with the deep, lustrous finish you desire. Designed and tested to deflect heat generated from the V-Twin, the mid-frame air deflectors are enlisted for duty on every ride, especially the hotter days. 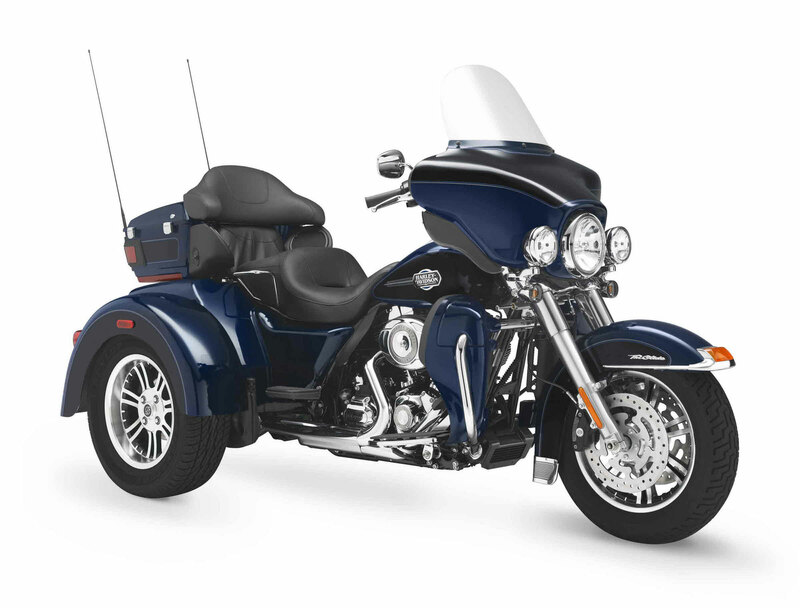 These low-profile black deflectors are mounted to the frame of the Tri Glide™ Ultra Classic® model just below the seat, and move the heat away from your legs and body. Summer rides just got more comfortable. Don’t be a prisoner to the elements outside—take control of your ride with the color-matched fairing lowers on the Tri Glide™ Ultra Classic® model. Pop them off for a cooler ride or leave them fixed to fight the wind tooth and nail. Use the integrated glove boxes to empty your pockets, ditch your phone, and ride free. When it comes to touring, Harley-Davidson is all about optimal comfort every time you hunt down a horizon. Your boots were made for riding, in any way you see fit. Our full-length footboards boast a tried and true design that’s stood the test of time. Rubber vibration isolation for a comfortable ride. Traditional toe shifting is familiar to seasoned riders and intuitive for those just starting out. Heel shifting makes getting through the gears even easier and more convenient. Height adjustable passenger boards add another level of comfort for your riding partner. – Rubber-mounted Twin Cam 103™ V-Twin engine with Electronic Sequential Port Fuel Injection (ESPFI), rated at 101 ft. lbs.